One of the remarkable traits that my parents-in-law have is their zest for life. 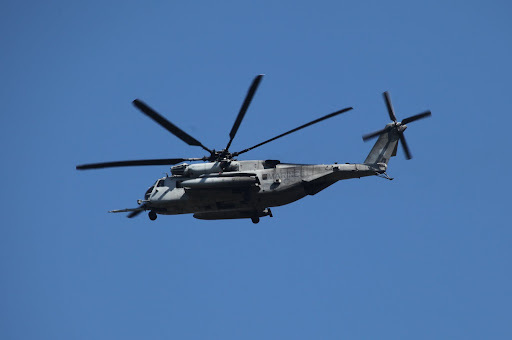 Last Thursday, just as the sun had risen, they called informing us that they were driving to San Diego from Las Vegas. “You're on your way here?” I heard my husband saying. A few hours after, they called and said “We’re in Barstow and we’ll be there soon!” said the chirpy voice of my mother in law. True enough, before we knew it, we heard Mama B’s warm “Hello!!! How’s everybody!” by the door. Papa T and Mama B brought spring early to us. The house magically turned alive as my children joined in to devour all the food that they brought with them. From the shimmering gold and yellow color of the custard flan, to the strong scent of lemon grass and the greens that go with Pho, and to the grilled pork chop releasing an earthy flavor -- we enjoyed immensely the feast they brought to us. Everything turned warmer and brighter with their arrival. The next day, while my husband was at work and the kids were at school, Papa T, Mama B and I drove around San Diego to try out his camera's new lens. Contently, I watched them from the rear end of the car, Mama B singing along Celine Dion's Because You Loved Me on Sirius satellite radio and Papa T driving around the canyons in search of views to capture. I was sitting alone at the back, quitely absorbing and basking in the strength and beauty of their relationship. My in-laws have shown me how to look at the world in a new way. A world full of optimism and hope, that when I get older I should look forward to the days to come, as these days will get even better. I was there happy to look through a window into the future, wishful that in 20 years, my husband and I would enjoy the life that my in-laws currently have. I've talked about them in this blog previuosly, here and there. 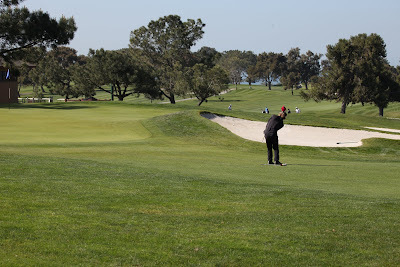 With Papa T's permission, I am sharing the pictures he captured. 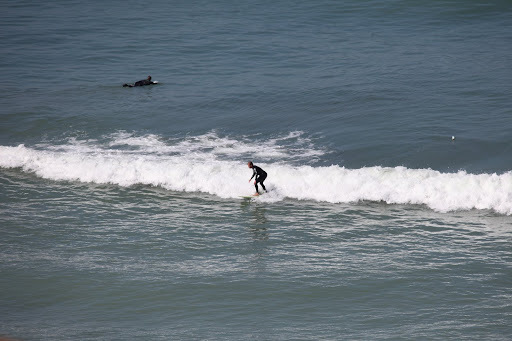 The sights are undeniably San Diego to me: the sight of a Navy helicopter hovering the sky, the surfer riding the waves during winter, the breathtaking seascape of Torrey Pines in La Jolla that greets me as I drive down highway 101... ahhh indeed, such a fine San Diego day. And I get to enjoy the experience twice... the second time through Papa T's lens. Thank you also for letting me see life through a new view, like that of a new lens of a camera, able to capture the essence of the moment... and letting me get a glimpse of the future. Season with calamansi or lemon juice, salt and pepper Add some calamansi rind or zest. Fry the lumpia in a pan until golden brown. Set aside. Combine all the ingredients together except for the sesame seeds. Let it thicken. Adjust according to your taste. You are now ready to enjoy your fish lumpia! See it was that easy! I went one step higher... and added the sauce on the lumpia. However, you should eat the lumpia right away it will become soggy. M - Your in-laws sound like a dream! I grew up in San Diego and loved it! Lumpia looks fabulous! I've never seem sauce dipped onto them like that. Yum! these look so delicious! great shots! As Len would say, I will try it with bangus. ok am going to sit with my code now and email u about the column ok...u wanna ur main column a little bigger right? What a lovely post! So heartwarming. :) Gosh, I love what you cooked!! Lumpia, is it? It looks mouthwatering!! Your Papa and Mama always had the zest for life. You are blessed to have them as in-laws. Tony's pictures are beautiful and your lumpia as well. @Christine: I didn't know you grew up here in SD. I thought you were from SF. I love your hometown! yes SD is beautiful! Houstonwok: thanks David and thank you for the RT in twitter. you rock! Azita: hello, welcome to my site, I'm glad to meet you! Divina: It take great parents to raise a great guy. I'll pray with you! I'm excited for your DIvina... you are getting there! yeah, bangus sounds good. I have to get the boneless one! thanks for skipping to Malou! SUGAR PLUM FAIRY... you are such a sweetheart! YOU are bigger than life ! ok sending you ¨*•.¸¸♥¸ thanks for dropping by.. it brings a smile when I see you around! Mary: you're most welcome. yes the lumpia was so easy to make but lemme tell you, my family raved it! hello, I believe you are one of my in-laws' friends... so great to see you.. and yes i'm blessed indeed to have them. How wonderful that you have such an amazing relationship with your in-laws! The sound like lovely people. 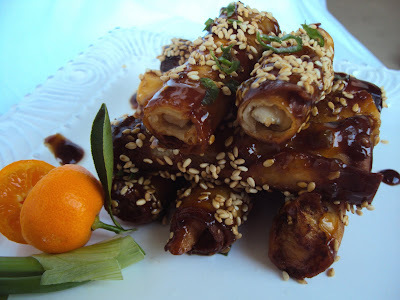 Now, this lumpia are delicious, especially drenched in sauce! 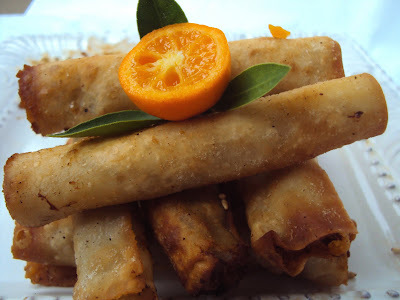 They remind me of the bangus lumpias we had in Manila - I should make some for this Friday . . . These look so good. I can immagine that once i start eating these I wouldn't be able to stop. They look delicious Malou. Dont you just love having relatives over. My dad has 11 brothers and sisters. So I have a tonne of family. A get together for us is no where less than 10 people at a time. I love it. I have only had fish lumpia once. It's so good. I like the sauce you have with your version. Malou - I love the way you write about your family! I can imagine all your family gatherings - super saya I'm sure! And the lumpia - amazing - I never tried it with fish! What a beautiful relationship you have with your in-laws. You're such a lucky girl. The pics are wonderful. I've never tried fish lumpia before. I'm really excited to try this. This looks so yummy! It is so great that you have such a good relationship with your in-laws! Most daughter-in-laws would be annoyed if their in-laws just popped by unexpectedly, but your attitude is always so lovely. Those lumpia look amazing! Love the sauce poured over them...I can almost taste the goodness. 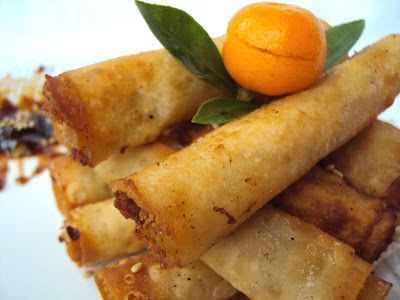 Wow, I think I'm salivating over the lumpia! They look absolutely delicious. BTW, I hope you don't mind, but I've given you an award. I love your blog -- feel like I need to make sure I have a box of tissues each time I stop by, your stories are so heartwarming! 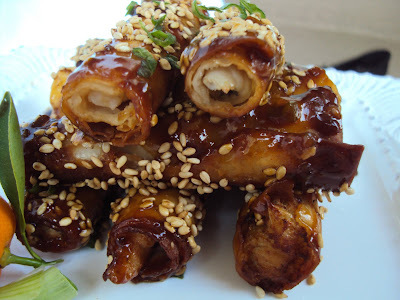 I love the fish lumpia it looks so delicious! i've only had regular lumpia before never with fish, but I'm going to as my aunt for her lumpia recipe so I can compare both :) and lumpia with sauce yummy! Lou, lou skip to malou...LOL! You know that song? It's in my head everytime I come to your blog. Malou the way you write, food to my soul! 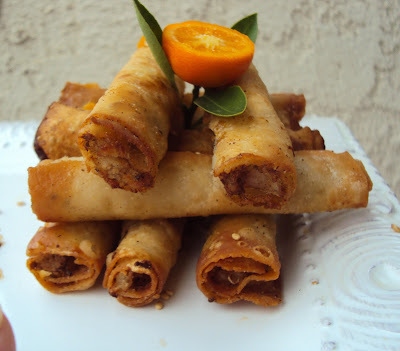 Those lumpia looks so yummy! I could eat the whole batch! I love San Diego! 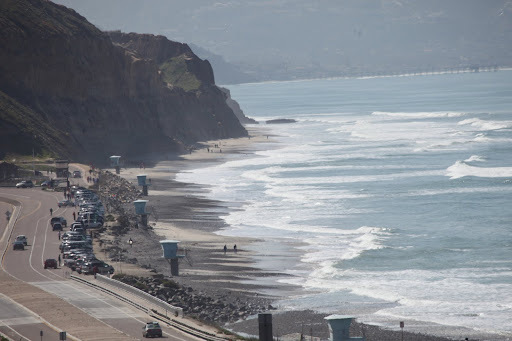 Used to drive there from Orange Country and enjoy the beach, the pelicans, La Jolla and whatever else; I went back a couple years ago to accompany my son who was giving a talk and thought it was so different, so urbanized, but still beautiful, of course. Your in-laws sound like such nice warm people. Wow, I've only had non-fried lumpia. This looks pretty delicious! Papa T takes good pictures! 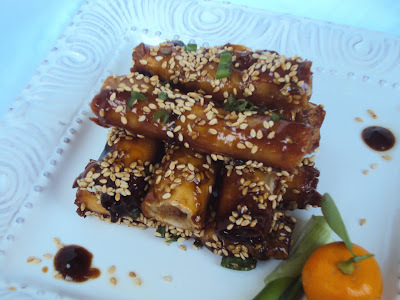 Tracey: I heard bangus belly lumpia in Manila is good but haven't tried it yet... i bet it's good. VSSF: you are such a doll... you made me smile again haha... yes didn't you notice that my page is wider now... i followed your instructions... thank you!!! Cookies and Cream: you are one of my faithful readers... you bring a smile on my face too everytime i read your comments. Liren: I am honored to receive the award.. i don't know how to get it though hahahah but I will, i will follow the rules. Nastassia: Thanks for the email and for the comment. I will definitely come by your site regularly! Foodie2: as always.. you're there for me too! TOB: I didn't realize that you have an adult son already.. you look so young. UK: I'm thrilled to see you stop by. I enjoyed your recent chronicles... such a great experience you just had! Wow. I've never had fish lumpia before. I must try this out. It looks fantastic. I love the shots of San Diego, too! 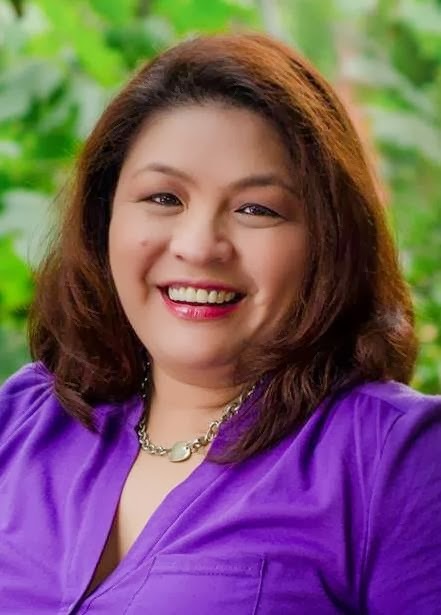 Malou, I loved your homage to your inlaws, but I think they are lucky too to have a daughter-in-law who recognizes their uniqueness. Your lumpia is to die for! I will have to try this some time. Thanks for your kind remarks. Never been to San Diego..Lovely pictures.You are so lucky to have wonderful in laws..
Memoria: thanks for stopping by and I hope you could try this lumpia sometime. Penny: hello great to see you again.. and thank you for the sweet words. What a wonderful post. You are very lucky daughter-in-law, and your husband's parents are equally blessed! The food looks as terrific as the scenery! awesome pics...wonderful wonderful space u have here! Chef Ed: great to see you stop by! Lovely space you have got here dear. Would you be interested in participating in a giveaway at my space? Check my latest post for details.